Protects: Aprilaire dehumidifiers reduce overly humid conditions to help protect furnishings and belongings from warpage, mildew and rot. 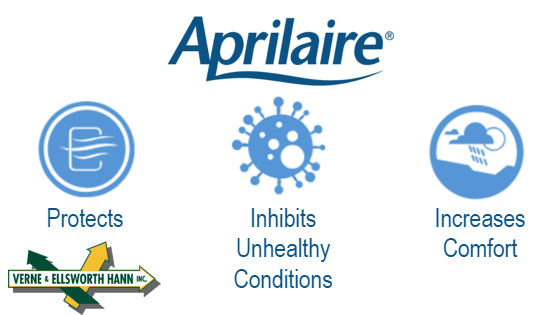 Inhibits Unhealthy Conditions: Reduces growth of allergens like mold & mildew and dust mites. Increases Comfort: Gets rid of that sticky, cold clammy feeling and musty smells. Take control of your home’s humidity with Verne & Ellsworth Hann. The trained professionals at Verne & Ellsworth Hann have decades of experience working with dehumidifier equipment. Whether you are interested in having a dehumidifier installed or need repair or maintenance on an existing system, Verne & Ellsworth Hann is proud to offer quality service throughout the Greater Cleveland area. Contact Verne & Ellsworth Hann, located in Cleveland Heights, at 216-932-9755 today.